What is Electrical Computer Aided Design (ECAD)?, What is MCAD?, What is Model-Based Development?, Model Based System Engineering (MBSE), What is Routed Systems Design (RSD)? How do you develop smart connected products? This eBook is of most value to engineering executives assessing how to retool their organization in order to develop smart connected products. Today, the Internet of Things (IoT) is driving dramatic change. Some see it as an incredible opportunity, while others view it as a dire threat. Either way, companies who embrace the technology are using it to enable broader transformations. They use it to gain insight into product usage, remotely monitor products, and preemptively schedule maintenance calls. However, the scope of the change is not limited to company operations after product delivery. The products themselves are also undergoing fundamental changes. To leverage the IoT, businesses are creating smart, connected offerings, and products traditionally made of mechanical components are now seeing an influx of sensors, antennas, circuit boards, embedded software, and complex wiring harnesses. The transformation of products, of course, carries serious implications for engineering organizations. Design teams need new skills, processes, and technologies to develop smart, connected products on time and under budget. But what roles need to be filled? What new training is needed? How can streaming data be used? Exactly what processes need to be adopted? What new tools need to be acquired? The purpose of this eBook is to answer these questions. 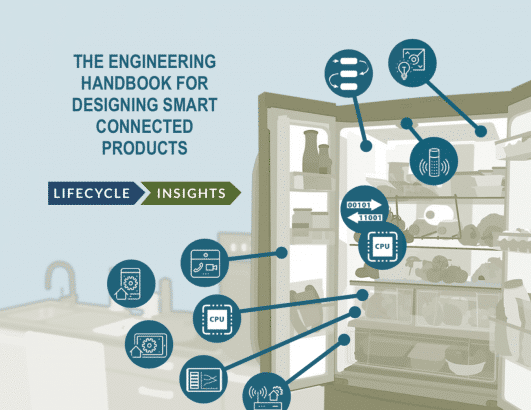 It provides details on the trends driving companies to develop smart, connected products and explains how streaming data can be leveraged. It discusses the changes companies need to embrace to make the transition to a new age of smart products with less disruption. Read on to learn how your organization can navigate such a transformation.